It’s a trade of the booziest kind: a gin joint swapped for a mescaleria. 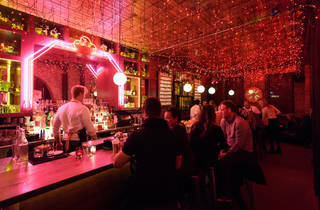 Tucked next to Saxon + Parole in the space that formerly housed Madam Geneva, this Latin-spirited cocktail haunt straddles the line between speakeasy and dive bar, accessible through an interior door from the neighboring American restaurant. (There’s also an entrance on Bleecker.) 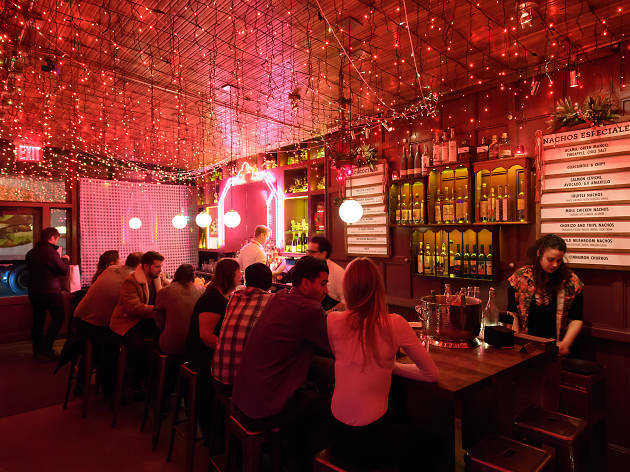 For the sliver of a bar—festooned with red lights that cast a glow over everything (an IRL Instagram filter, really)—head barmen Nacho Jimenez (the Daily) and Eben Freeman (Genuine Liquorette) built a menu that emphasizes mescal but isn’t committed to the liquor. 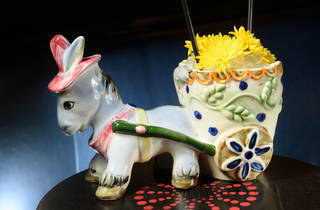 Instead it touches on stuff like Nicaraguan rum and tiger-nut horchata, and yes, some of ’em are served in ceramic donkey cups. 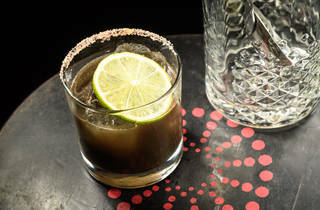 ORDER THIS: Classic cocktails feel familiar but new, like accidentally running into a friend out of context: margaritas imbued with the mushroom funk of huitlacoche-infused mescal ($15), or a frozen version flavored with tamarind and splashed with chamoy ($14). 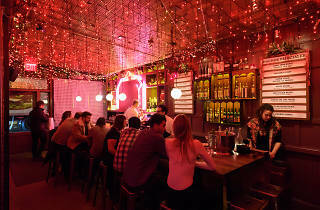 The standout cocktail, however, is the namesake El Burro Fantasma ($26), a for-two option that packs a punch of mescal and chili, soothed slightly with pink grapefruit and Aperol. GOOD FOR: Kicking the night off right. 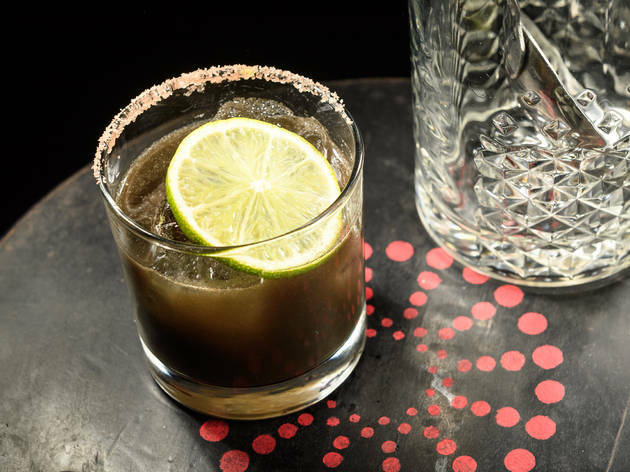 House-made mixers, like the ginger beer in El Diablo Swizzle ($14), adds a flavorful bespoke pop to cocktails, elevating them from mere after-work drinks to start-of-a-big-night cocktails. 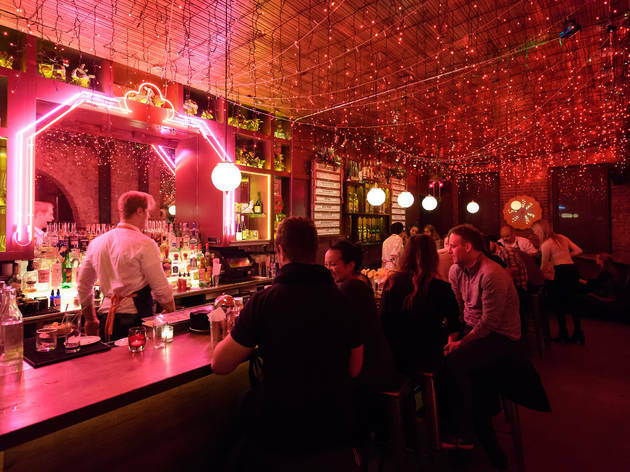 Booming ambient pop music and a whirling crowd—watching barmen shake cocktails while you’re lounging on the few coveted sofas in back—add to the fun-loving vibe. 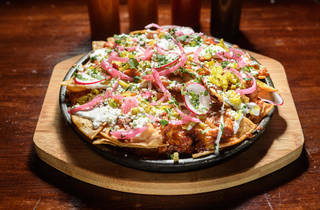 THE CLINCHER: The proper accompaniment to the bar’s cocktails is a hefty portion of haute nachos turned out from the kitchen on cast-iron fajita plates. They come in varieties like white cheddar with black truffles ($23), chorizo with tripe ($13.50), and chicken with a just-sweet-enough mole in every crevice ($13.50). 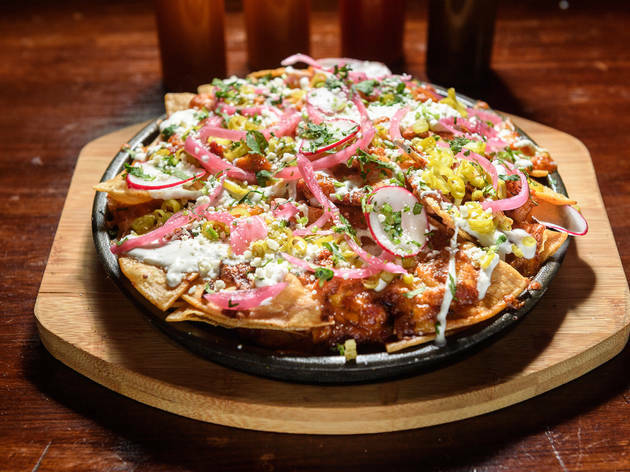 Customize the spice with one of four house-made sauces ranging from a sweet ají dulce to only-for-the-well-practiced chili de árbol. And if that becomes too zesty, ease away from the heat with warm, delicioso cinnamon churros ($9). I actually liked this place and would recommend it, but the drinks let me down. They didn't have the donkey cocktail they were known for the night I went and there was a 20 minute line. And the place is small. If you're able to get a seat though, the crowd is normal, the music is great and the red lights add some flair. 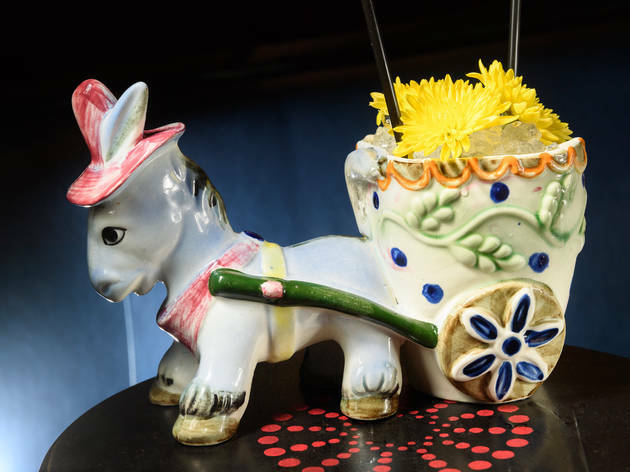 Ghost Donkey is such an amazing new bar! I found it on a best new bars of 2016 list the night before and decided to check it out. When I arrived on a Tuesday at 7pm it was packed! Luckily we found a seat and got to enjoy the aesthetics and drinks. Must try's: the cocktail for two!! The churros were also so good! I can't wait to go back! Service was amazing despite how crowded the bar was. Talk about a great surprise. Walked into this treasure on a chilly Sunday Funday. The entire ceiling dripping in red icicle lights make this a cozy & Instagramable location. Grabbing a seat on the large leather sofas in the main room with the Ghost Donkey himself. (We named him Raul Juan Pablo Sanchez) Instantly the bartender came over with menus & was more than knowledgeable of the drink selection. Catchy names like Champagne Cobbler, El Diablo Swizzle, Prosecco & Paletitas makes you try every drinks. Nice selection of food to noch on. We choose the churros drizzled with Dulce de Leche & gucamole & chips. Perfect combo!!! It's a great place to sit & catch up or if your looking to cozy up with someone. Just 3 weeks new and they had a nice size crowd enjoying the music, food & drinks. Making a trip to the restroom???? Have fun & snapchat your friends under the colorful strobe lights!!! !